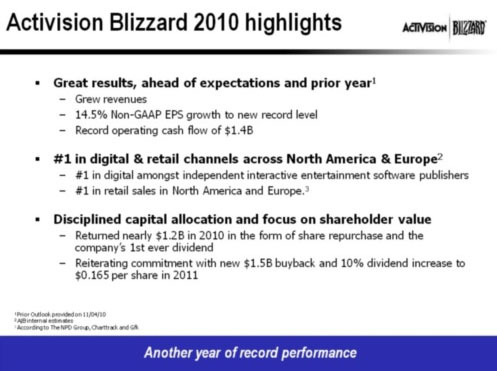 As Davidus reminds us, the Activision/Blizzard quarterly financial conference call was held February 9, 2011, and streamed online via the Activision Investor page. Because Blizzard Entertainment has not yet confirmed a launch date for its next global release, outlook at this time does not include a new game from Blizzard in 2011. Should we not release a major title from Blizzard this year, we would expect for planning purposes, to launch a minimum of two Blizzard titles in 2012. Most people (including me, listening live) have taken his quote to mean “nothing in 2011.” But if you parse it more closely, you might paraphrase it to, “we’re really hoping to get a game out late 2011, but if we can’t make it then we’ll definitely have at least two titles in 2012.” So we can keep hoping, but I wouldn’t bet the house. After all, when’s the last time a Blizzard game got done *sooner* than they anticipated? So we can expect to hear an announcement about the start of the Diablo III beta in their next conference call, for Q1 2011, which should take place in early May. Note that Jay Wilson previously said the game would launch about six months after the beta began. And since they’re not expecting to launch a game in 2011, we shouldn’t expect the beta to start before 3rd quarter 2011. During the Q&A at the end of the call, one reporter asked for clarification about Blizzard’s 2011 schedule, and got a reply from Mike Morhaime. Click through for that and more on the other subjects discussed during the call. Update: Blizzard released a written statement clarifying this issue and insisting that 2011 is not ruled out for a potential game release. Bobby Kotick’s opening remarks were heavily focused on the company’s focus on online expansion and social media implemented into their games. A lot of talk about Call of Duty online features and community, and Battle.net support for social tools via Starcraft 2 and World of Warcraft. He also spoke about the digital distribution of Starcraft 2. CFO Thomas Tipple spoke next, and delivered a lot of numbers. Cash flow, revenue projections, subscriber numbers for CoD and WoW, etc. He dropped some news halfway through when he revealed that Blizzard did not expect to release any games in 2011. So wave goodbye to Diablo III in 2011, or any chance of the beta beginning before the 3rd quarter of this year (with the planned six-month time from beta start to release). Tipple did surprise with the revelation (made for legally-mandated investor disclosure reasons), that Blizzard is not projecting any new game releases in 2011. More discussion covered new Activision/Blizzard games and plans, including Beachhead, a new development studio focused entirely on Call of Duty online community features. They also talked about the future of gaming, and that online titles are what it’s all about. The big keep getting bigger. The top ten gaming titles in 2010 were all based on established, existing products. Sequels or otherwise. Mid-sized games are not doing well, and Activision’s are no exception, and they’re cutting their losses on several fronts. Most notably, the Guitar Hero franchise is being discontinued. This includes DJ Hero. Though the products are well-reviewed, the sales of peripherals are dropping off, and there are heavy licensing fees for the music. It’s not making them enough profit, so it’s gone. Mike Morhaime spoke last, and he opened his remarks by congratulating Blizzard for their twentieth anniversary. Their 20th year was their best yet, with Starcraft 2 and World of Warcraft: Cataclysm the top two best-selling PC video games in US+EU sales. The company enjoyed over $850m in income this year. They sold over 3.3m units for WoW:Cat within a month, and over 4.7m for the year. SC2 was a big seller as well, with nearly 4.5m copies sold worldwide for the year. As for Diablo III, Morhaime said, “D3 development continues to go well, and we’re very excited about the game… I’m looking forward to sharing more news about the game, and our upcoming beta, during the next conference call.” He added a few more details during a reporter question later on, but nothing specific. That bit’s quoted above. Jeetil Patel from Deutsche Bank: Hey guys, couple questions. Your 2011 guidance for the year, you have a comment in there in that it does not yet include a Blizzard title. I guess, what is the qualifier to get a Blizzard title out this year? I guess – it seems – like the commentary seems awfully interesting in that it’s ? are you waiting for some sort of percentage completion? Competitive slate? Can you just maybe elaborate more on why there isn?t a Blizzard title this year? Thomas Tipple, COO and CFO of Activision-Blizzard: ? with regards to the commentary around the Blizzard title. As you know, and as we said before, we think that in the long run, Blizzard is good for one major release a year. But of course, we?ll always rule the quality of the game has to be there. And that?s why, for example, we didn?t have a release in 2009, but we had two releases in 2010. And as you can see, the results speak for themselves. So I think that has played out well for our shareholders. With regards to Diablo, we don?t have a date yet. So we felt it was prudent not to bake it in. Because, again, we don?t want to find ourselves in a situation where we either disappoint or would have to make any compromises on the game quality ? which we would never do. If the title ships, you know, obviously, that would prevent material ops side (?) to the outlook we have provided. Jeetil: Yeah, that?s helpful. I guess, going back to the Diablo question. Can you talk about how far along it is in terms of percentage of completion? Mike Morhaime: So, I don?t have a percentage of completion rating for you today other than to say that the game is coming along very well. We?re very happy with the development progress that the team is making. But, until we get to beta and we have the community help us test the game, we aren?t going to lock in a release date. And, so, I just want to clarify that we?re not setting a date ? I?m not saying that it?s going to be 2012. I?m just saying that there isn?t a date yet. And so, given that we haven?t locked into a date, we fully support the decision not to include it in the guidance. Mike clearly wanting not to rule out 2011 with his remarks here. That’s why he insisted that 2012 isn’t set in stone. So you can keep hoping, and D3 in 2011 isn’t out of the question, but it’s clearly pretty unlikely. Finally, here’s a slide of bullet point info that displayed on the pop up audio player box. Details! What do the Blizzard CMs Do When They Do What They Do?